Many moons ago, I heard Lisa Lutz speak at the L.A. Times Book Festival. She explained that although her books are often categorized as mysteries, they don't exactly fit the mystery mold--at least not what a reader might expect. What they are is about a family of Private Investigators (P.I. ), and rather eccentric ones at that. While I am sure I have a copy of the first book in the series (and the subsequent ones--from my "must collect entire series before I read it" days), I actually read the copy my mom loaned me. It was a spur of the moment sort of situation. Mouse had FINALLY fallen asleep--but on me. I didn't want to risk getting up to search for my e-reader or copy of The Stand because if she did wake up, it'd be all cries and lots of comforting with only a miniscule chance of her going back to sleep. And so I grabbed the only book in arm's reach: The Spellman Files. The next week when I was getting ready to decide what to read during my lunch break, The Stand or The Spellman Files, I chose The Spellman Files. It's not that I am not enjoying The Stand--I am--I just was in the mood for something a bit more comical and quirky. 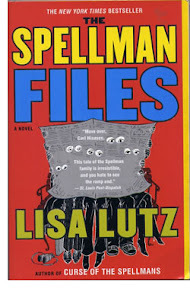 Isabel Spellman, the uncompromising—okay, obstinate—twenty-eight year-old San Francisco private eye in Lisa Lutz's riotous debut novel, THE SPELLMAN FILES has her share of problems. And those problems all happen to be named Spellman. Her parents, Albert and Olivia, co-owners of Spellman Investigations, think nothing of placing their daughter under 24-hour surveillance simply to find out if she has a new boyfriend. David, her perfect older brother, who escaped the family business by becoming a lawyer, is hypercritical of just about everything Isabel says, wears, or does. Fourteen-year-old sister Rae lives on sugared snacks, considers recreation surveillance her favorite hobby, and believes that life is one endless opportunity for intra-familial blackmail. And good-natured Uncle Ray, a former cop and health food nut, now embraces gambling and drinking; and when he's not in battle with his niece Rae over the whereabouts of his favorite shirt, must be rescued from "lost weekends." Isabel's family is eccentric to say the least. Privacy is a hard to find commodity in the Spellman family and Isabel goes to great lengths to get just a little bit of it. When she meets a guy she likes, one she knows her parents would disprove of and who would likely be scared off by them, she attempts to keep the two parts of her life separate. It proves to be quite a challenge and eventually, on top of every other issue that's been building, it all comes to a head. What I loved about this book: the writing, the characters, the humor, and the story. I also loved that it was set in San Fransisco, one of my favorite cities. It was predictable at times, but as Isabel says in the beginning of the book, private investigations aren't so much about solving the crime, they are about finding evidence to support the (assumed) facts. And yes, it was a bit over the top in spots--but in a fun sort of way. The author does a great job of developing her characters over the course of the book. Particularly when it came to Isabel and her sister Rae. Isabel has always been a bit of a rebel, giving her parents all kinds of grief. She is both confident and insecure, smart and yet immature. It's those kinds of dichotomies that really draw the character out of the pages. Rae has similar characteristics, only in different ways. She's the genius child who knows what she wants and goes after it. Underneath, however, has a great need to belong. It seems to be the trademark of the Spellman family: tough on the outside, while being vulnerable on the inside--only, don't let anyone, even other family members, know. First person narratives can be challenging, especially in a character driven novel. Lisa Lutz pulled it off though. Even through Isabel's eyes, I felt like I understood her parents' concern for her given Isabel's past as well as Rae's growing frustration. Just over half way through the book, Isabel takes on a missing person's case and I couldn't help but notice the parallels between the two stories--the one involving the case and the other involving Isabel's own family life. I won't say more for fear of spoiling the story. I really like how the author tied everything together in the end. The humor in the book is sometimes cynical, sometimes ridiculous, and I laughed out loud a few times. There was a nice mix of the serious, however, which added a nice balance. I really enjoyed my time with The Spellman's but I have to say, I am glad they aren't my family! Living in their household would be exhausting. You can learn more about Lisa Lutz and her books on the author's website. Source: I read my mother's copy of the book which she bought at an author's signing earlier in the year. Sound fun. I've been thinking of giving her a try and managed to pick one of her titles up free for the Kindle so will have to line up. Thanks! Nicola - I hope you enjoy her book! My mom's been flying through her books, and I'm looking forward to reading more by the author in the near future. A good friend of mine loves this series and keeps urging me to give it a try. Kathy - At least from the first book, it seems like the series would be a quick read. I would love to try something like this, and I think I have a book co-authored by Lutz called Heads, You Lose. I am going to give that one a try first, but this series has definitely caught my eye, thanks to your incredible review. Great job on this one! I need to see if I can find it! Heather - I think I saw Heads, You Lose in the store the other day. I didn't stop to give it a look though. :-( I will look forward to your review to see what you think of the author's writing! Sounds like you reaching for a book and having this one be the one you picked was very serendipitous. Glad you enjoyed it so mcuh. I have this book patiently waiting for me on my own shelves. I REALLY need to read it and sooner rather than later. Glad to hear that you enjoyed it! Samantha - My copy had been lying around for what seemed like forever. It is definitely worth reading! Susan - I understand. There is only so much time in a day to read. :-) If this first book is anything to go by, I'm sure I'll love the series like Raidergirl too! I have never heard anything but good things about these books. I always seem to forget them when I'm in the book store, though - my list of books to look for has grown much too large to carry around! I will have to think about reading this series. I love books that are ridiculous and make me laugh....sounds like fun! Staci - I think you would like this one, Staci. Lisa Lutz is a good writer.